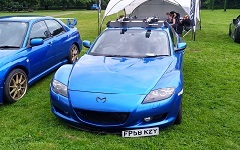 JDM Combe is back, and the Club will be representing the RX-8 with another impressive stand. If you've not been before, you can look forward to all the Club display stands, track sessions, drift car demos, show & shine competitions, the top 25 parade and even pro race driver passenger rides! Find out more at the JDM website. We also have an exclusive Club track session in the morning, and we'll be providing hot food, cakes, tea, coffee and cold drinks upon arrival and throughout the day. Most of which is provided by fellow members. Booking information can be found here, please take a look before purchase. Space is allocated when bookings close, so please book early to help us secure our favoured (enviable!) stand location. Please post up your interest including how many you intend to bring with you, and we will add your name(s) to the list. If you have any questions, just post in this thread and we'll do our best to help. Driver = GSB-TDU / Passenger = ? Last edited by Ian.Mothersole on Tue Apr 09, 2019 3:02 pm, edited 12 times in total. To book your Club stand parking pass with 3 passenger passes and any additional public track sessions your require, you will need the Club code. Please PM me (Include your real names as well as your forum name) for the code before making your booking. Early-bird discounts close six weeks prior to the event, so be sure to book early to avoid disappointment! MRC members, please identify as an MRC member when PMing, or alternatively, Clive also has the code. NOTE: This code is for our members use only, and must not be shared outside the club. The Castle Combe CLUB BOOKING DEADLINE (Stand & Passenger Passes) is Tuesday 7th May at 9am. (Subject to availability - this may close earlier) Booking early is recommended. There are only 28 spaces available in the session therefore early booking is advised. Castle Combe club track session policy is to only allow one track session per club, but I have first refusal on another club session that may become available, but the time is not known yet. Early-bird track time price is reduced automatically by £5 when using the club code, if you book before the cut off date. Put me down please, track as well (just about to pay for it). Think it'll just be me atm. Thanks Chris, have bought my pass, and the club exclusive track session. just purchased club stand pass and experience track session at 14.15 via the CC website and also paid for the exclusive Rotary session at 11.25. Bumpety bump. calling all previous JDM attendees where are you?